1 new fashion casual leather hand strap multi-color selection size 42mm Size: for 6.1 “-8.5” (155mm-215mm) wrist (buy strap to send the dial transparent protective cover) [Apple Watch Band] – This band is suitable for 42mm Apple watches including Series 1 Series 2 Nike + Sport Edition version. Even if you buy a $ 269 sports apple watch, you can also upgrade it to luxury, and with this beautiful combination. 2 [Nice fashion leather band] – High quality leather with stylish and luxurious features to bring comfortable feel. The color may vary with the natural variation of the leather used. This is the normal look. 3 [Upgrded Bulit-in Apdator] – Contains metal connectors for easy installation. We use the upgrade screw to lock the band. The screws will not fall off and will usually occur on other belts sold by other sellers. 4 [Standard Wrist Size] – This wristband is a standard wrist size between 155-215 mm. If you have a big name, we recommend that you choose a large buckle made of suede leather. 5 [one year warranty] – provide one year unconditional warranty refund or replacement. Lifte Time Customer Service. If you have any questions about this item, please feel free to send a message via Amazon. Your information will be answered within 12 hours. Size: 42mm | Color: Retro – Brown, Dark Brown, Gray feature: Easily adjust the length to fit your wrist. Applies to all versions of Apple Watch Series 1 Series 2 Series 3 Series Nike + Series. Made from the first layer of leather, designed in the luxurious mad horse color and pattern style. Fashion design style, personality rather than simple life. Apple watch 42mm Size: for 6.1 “-8.5” (155mm-215mm) wrist There are three colors. 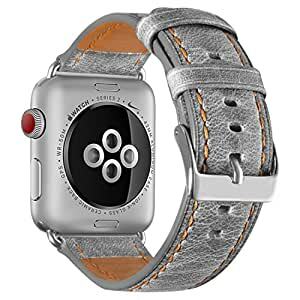 (Brown, dark brown, gray) Includes: 1 x belt for Apple watches with connector adapter. service: We are the most professional strap designer and manufacturer, to provide you with the best products. If you have any questions, you can contact us at any time. Friendly customer and transportation service.